High Profile, Cooperstown Classic 1999 Cap. Classic New Era MLB 950 Snapback Hat. New Era Embroidered side Logo. Grey Colorway Underneath Brim of Hat. Generally Fit up to 7 3/4's (Fitted Size). Premium Quality, Comfortable Fit. Fully adjustable 9FORTY profile. 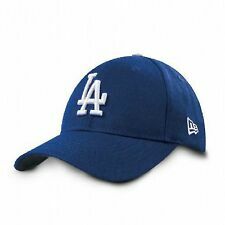 Dodgers’ ’LA’ emblem embroidered to the front of the crown in raised white stitching. New Era logo embroidered in contrast white stitching to the left hand side. All-over Dodger blue contoured 6-panel crown with matching curved visor. New Era 9Forty New York Yankees Seasonal Camo Baseball Cap.Black and Grey Midnight Camo coloured cap, with the NY front logo,the N ew Era side logo, and the Grey visor underside. Style Baseball Cap. The cap has an adjustable rear slide strap. Allover camo effect on Cap. Trucker style. Seattle Seahawks embroidered logo on front. Embroidered New Era logo on side. Adjustable fastener. Embroidered 'Cleveland Cavaliers' logo on front. Embroidered 'New Era' logo on side. Snapback fastening. Trucker style. Embroidered 'Los Angeles Lakers' logo on front. Embroidered 'New Era' logo on side. Trucker style with snapback fastening. Classic New Era MLB 950 Snapback Hat. Grey Colorway Underneath Brim of Hat. High Profile, Classic 2 Tone color Cap. MLB Authenticity Sticker Under the Brim. New Era Embroidered side Logo. Has a thick, Durable Panel Material. Classic MLB Snapback Hat. Grey Colorway Underneath Brim of Hat. Generally Fit up to 7 3/4's (Fitted Size). The designs were inspired by hip-hop, skate and graffiti subcultures. It is devoted to providing contemporary apparel with anyone with style, character and creativity. High Profile, MLB Cooperstown Classic Cap. Classic New Era MLB 950 Snapback Hat. MLB Authenticity Sticker Under the Brim. Grey Colorway Underneath Brim of Hat. New Era Embroidered side Logo. Burgundy Snap Closure. 3D embroidered Seattle Seahawks logo on front. Embroidered New Era logo on side. Adjustable fastening. Trucker style. Classic NBA Snapback Hat. Grey Colorway Underneath Brim of Hat. Premium Quality, Comfortable Fit. Raised Embroidered Front Logo. The designs were inspired by hip-hop, skate and graffiti subcultures. It is devoted to providing contemporary apparel with anyone with style, character and creativity. Metal New York Yankees logo on front. Embroidered New Era logo on side. Adjustable back strap with metal fastener. New Era 9Forty Chicago White Sox The League Adjustable Baseball Cap.Black with the Chicago White Sox front logo,the N ew Era side logo, and the WHITE SOX rea r strap logo. Style Baseball Cap. Main Colour Black. New Era 9Forty Baltimore Ravens NFL The League Adjustable Cap. Black with the Ravens front logo,the N ew Era side logo, and the Ravens rea r strap logo. One size fits most, with an adjustable rear velcro strap. This is a New Era9Forty NBA Utah Jazz Adjustable Strapback Cap. This New Era strapback cap is made from 100% Polyester. Strapback Cap. Style: NBA Utah Jazz. MPN THE LEAGUE UTAJAZ O OSFA. Style Baseball Cap. New Era 9Forty NFL 2019 Draft Team Cap. Team colours with the Chicago Bears front logo,the N ew Era and GSH side logo, the NFL 100 rea r logo, and the Orange Stars. Style Baseball Cap. (See below). A simple way to achieve a fresh look, this New York Yankees supporters cap by New Era lets you combine your love of MLB with a relaxed style. New York Yankees official team logo embroidery. Rounded crown. Trending at AU $38.31eBay determines this price through a machine-learned model of the product's sale prices within the last 90 days. New Era 940 Dry Switch Baseball C ap.Cardinal with the LA Dodgers front logo ,and the New Era side logo. Style Baseball Cap. Main Colour Cardinal Red. (See below). International Del ivery Options. Printed '76ers' on front. Embroidered 'New Era' logo on side. Snapback fastening. 3D embroidered Cleveland Cavaliers logo on front. Embroidered New Era logo on side. Adjustable fastening. Trucker style. New Era 9Forty NBA The League Adjustable Team Cap.Black with the Brooklyn Nets front logo,the N ew Era side logo, and the BROOKLYN rea r strap logo. Style Baseball Cap. (See below). International Del ivery Options. Matching Timberland Beef & Broccoli Field Boot. Classic New Era MLB 950 Snapback Hat. "Yankees" Embroidered graphics on the back. Grey Colorway Underneath Brim of Hat. New Era Embroidered side Logo. The designs were inspired by hip-hop, skate and graffiti subcultures. Embroidered New York Yankees logo on front. Embroidered New Era logo on side. Perforated fabric at rear of Cap. Snapback fastener. 100% genuine New Era 59FIFTY Fitted cap. 100% Authentic New Era Cap. Brisbane Heat New Era Cap BBL 9Forty Curved Brim Hat In Black. Logo: Stitched Brisbane Roar logo with New Era stitched logo on side front panel. Fly your own flag with the new 2018 curved brim baseball cap from New Era. 9FORTY Cap features an embroidered team logo at front, stitched New Era flag at wearer's left side and team logo above an adjustable closure at back. High Crown. Custom reflective taping on the interior of the cap. Structured fit. 6 panel construction with embroidered eyelets. Micro suede visor. Wipe clean with a damp cloth. High Profile, Snake skin Visor / Strap closure. Material: 100% polyester / 100% P.U visor. Classic MLB Snapback Hat. MLB Authenticity Sticker Under the Brim. Black Colorway Underneath Brim of Hat. The designs were inspired by hip-hop, skate and graffiti subcultures.